We are starting another edition with BM#55 for August! Half year just flew and I guess for some of us, atleast BM group, time flies, just discussing the themes and how we go about cooking and managing the months. Due to unexpected events, I had to miss the last week of July and it almost feels like I haven’t sat to write at all. I am starting the first week with a theme focussing on Nutella. I have made Homemade Nutella and it was such a hit. However getting the hazelnut here is quite an expensive affair and going all that hassle makes one think you can just get a bottle off the shelf. Nutella is always stocked, one if not more all the time. This time though I got another extra just for these dishes and Konda was complaining that I used up their regular bottle as well. I opted for simpler dishes, knowing the more complex dishes only end up taking more time than I can afford. 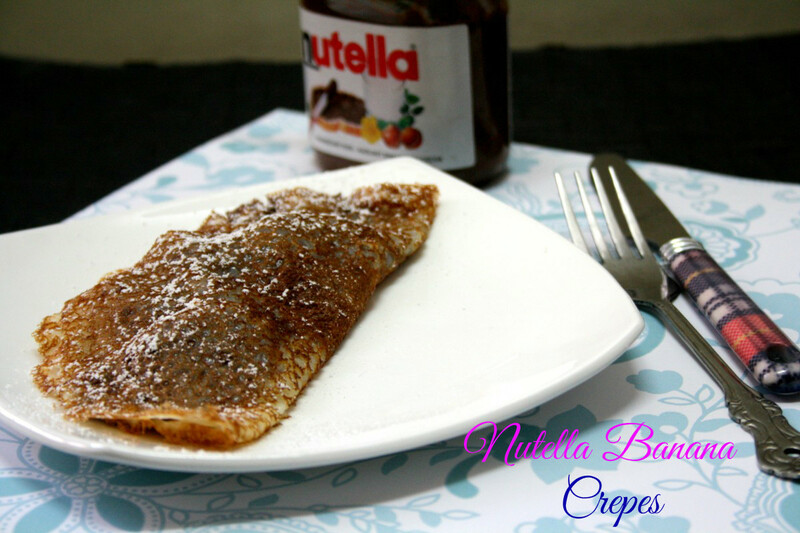 So for the day 1, a simple, yet delicious quick Eggless Crepe topped with Nutella and Banana. I know you must be thinking I simply spread on it and pack this off as Nutella dishes! 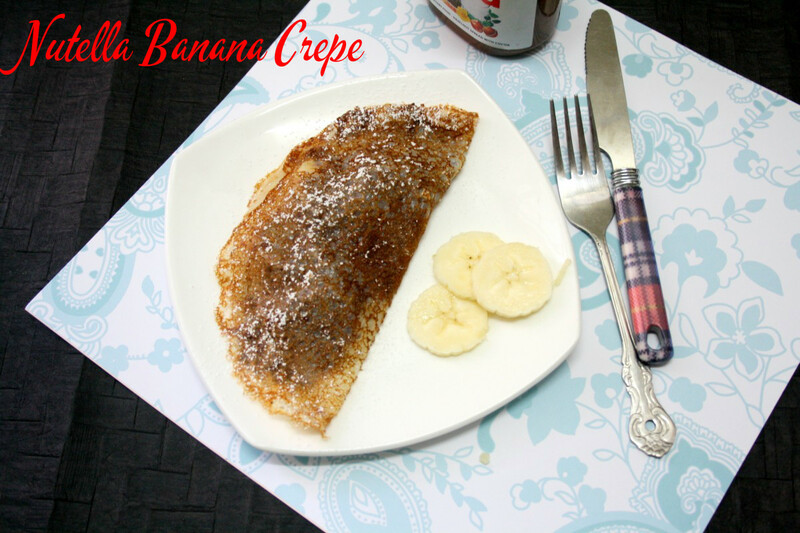 I wanted to make this after remembering my experience of eating a delicious one Nutella Banana Crepe, at SFO, during my visit many years ago. It was such a nostalgic moment, reading and reliving those days. I have already posted a baked version of this very same dish. Now you can enjoy this as well! In a bowl, take the flour, icing sugar, baking powder, salt, Fluff well. Slowly add milk to make a thin batter. Heat a non stick pan with butter. Pour the batter and quickly swirl around to coat the pan. Cook on low flame for 2 -3 mins, making sure the pancake is cooked well. Transfer to a serving plate, on one side, place thinly banana slice. Spread Nutella on the other half moon. Sprinkle a pinch of cinnamon. 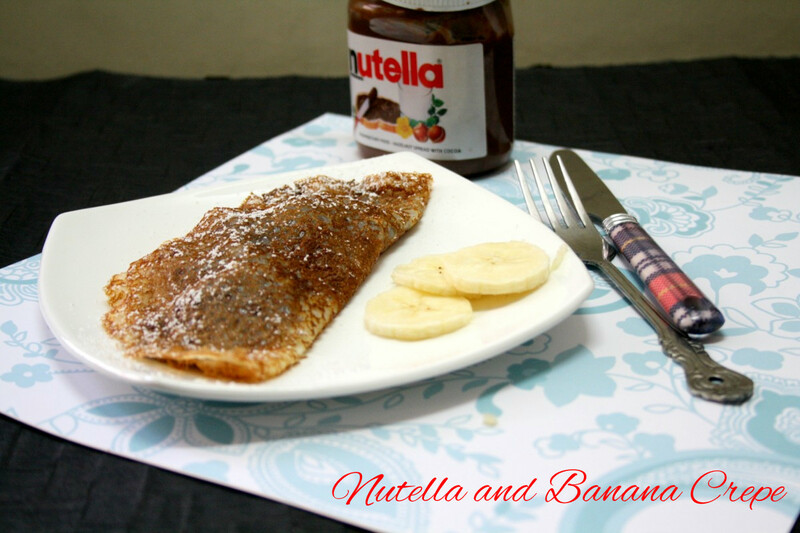 Bring the nutella spread side to cover the banana completely. After covering, sprinkle with icing sugar and serve right away. You can serve with whipped cream as well. that is finger licking good!!! 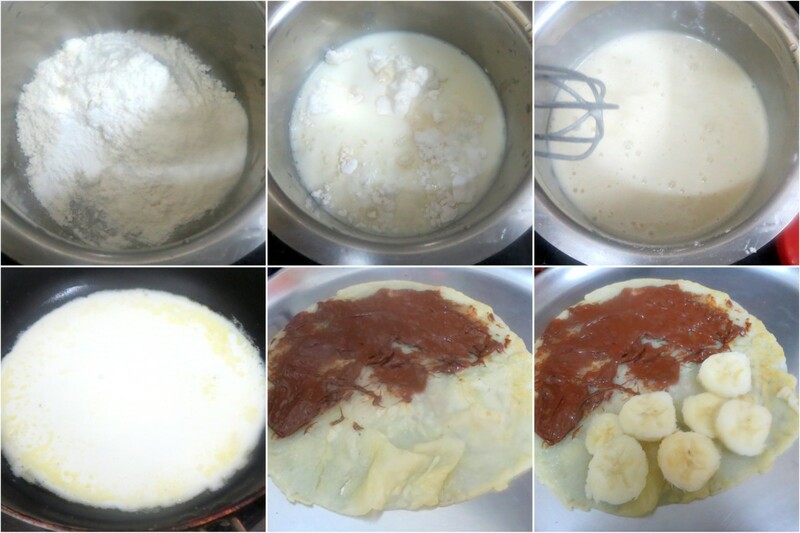 so yummy..
Who can resist these delicious crepes. Crepes are so delicious and tempting. My little one will jump at the option of having nutella with crepes/dosas 🙂 Fantastic idea though.